Stand up and be counted! You can do this! You got this! Hastag or not, Houston shows it’s underlying strength in times of adversity. The hashtag has surfaced everywhere showing us to be tough but big hearted and strong enough to face what it takes to rebuild our city. Being strong takes courage however we know we can rebuild our city. Our stengths comes from knowing how to work hard, be kind, and take on what comes our way. Many hands make for light work. That’s especially the case when disaster strikes. Having a team not only eases up on the work itself, it also helps with the stress. Research shows that surrounding yourself with positive people, energy and conversations makes hard situations easier. When you are together, process the situation, make it fun and also get work done. It’s overwhelming and endless when you are undoing the damage of flooding. Be the person that turns things upside down and make team work happen. Think about how to be a part of the solution! In our community local churchs banded together to aid families in need. Food was available all over the community. Boaters from the “Cajan Armada” rescued our people over and over. Find a fit for your strenghs and share the work and fun. It’s not always easy to find the good. It can be distracting when traffic snarls while getting to your home to clean up. It’s an emotional roller coaster when you are working on your home and emptying all your first flood onto your lawn. Find a way to find the good. Here’s the little things I noticed in the last 2 days that helped me find the good in our community. A “corner store” on the corner of 2 streets, giving away from cleaning supplies, food and supplies. ” A boat came and got us,” driven by the Cajun Armada, people from Louisiana who knew the devastation a hurrican causes. Thousands were rescued by these men and women. Families helping families rip up flooring. Kids, moms and dads working together to help other families that they had not met. Free food, supplies, and support at every corner in our community. There’s never a good time for disaster. Our country has been through a lot this year. Texans are showing what it’s like to be strong, stay positive, and make a difference by helping others in our community. What lesson have you learned from Hurricane Harvey? 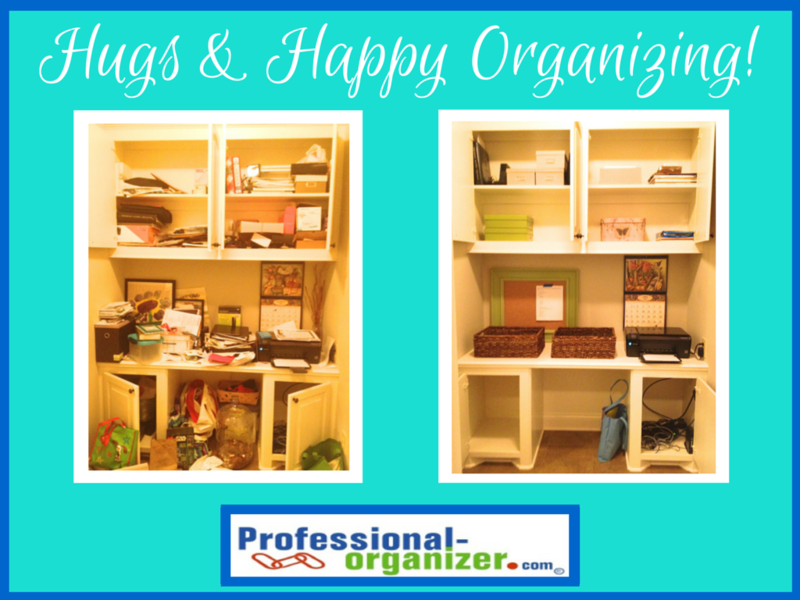 Hugs and happy organizing are client success stories. Here’s a story about a client’s bathroom and bathroom organizing. Bathrooms are busy places! It’s where you get ready in the morning to get out of the house quickly and easily. Bathrooms are also where there’s a lot of potential clutter. There’s hair, makeup and products galore. What’s a girl or guy to do? Decide what you want your bathroom sink area to look like when you are done. Are you a minimalist or someone who like to see what you are using. Know what you use every day and keep it easy to access. Use drawers for easy access with one category in each drawer or all your items in one drawer. This keeps it easy to find and use. Use under sink organizers to tame this chaotic space. By creating specific slots for specific items, your cabinet looks and is more organized. Let go of products you are not using or are old. Here’s tips on how long to keep different products. It’s hard to do, but important to keep from infections. Wishing you all the best as you do your hugs and happy organizing! With small green buds peeking out from the trees, or maybe just many feet of ice melting, spring is around the corner (thankfully.) It’s been a long winter of nesting. We may be especially looking forward to the change of seasons. We want to get started on our spring organizing. It’s time to recheck those spaces that are frequently used in your home. Those spots are the landing strip and command center. The landing strip is where all your bags and backpacks land each afternoon. Get this area back into shape by distributing what needs to go elsewhere in your home. Pull out the mittens, scarves and boots and place them back in closets for next year. Your command center is paper central for all incoming papers. Review what is there, recycle and shred what is not needed. Another season has passed and you know there are lots of unworn items in your closet. Before you do your season switch out, get started by pulling out, donating and consigning unworn items. It will make room for spring and summer, as well as help you lighten up your space. If clothes have gotten out of whatever order and organization is best for you, go back in and realign. You may find even more to eliminate after this is reorganized. Spend a few minutes reviewing your linens. Do you have too many blankets and sheets for your needs? Let go of extra blankets, pillows and older linens. Take these out to donate and create space. Have towels that are ripped or not a color the coordinates? Move these out to the garage for spills. Fluff up your bed by switching out to lighter linens. Let go of those extra decorative pillows (that you don’t place on your bed daily) and simplify your bedroom. Spring and summer are about fresh veggies. Make room for this in your kitchen, refrigerator, freezer and pantry. Go through and discard expired foods. Set up spaces that are designated for categories of food, like breakfast, dinner and snacks, so you can easily plan and make meals. Label your shelves for easy access and putting groceries away. It’s a great way to welcome spring, improve your eating habits, and make wellness choices easy. Finish up your fresh start with a new plant or flowers in your kitchen. It’s a lovely reward for your hard work! 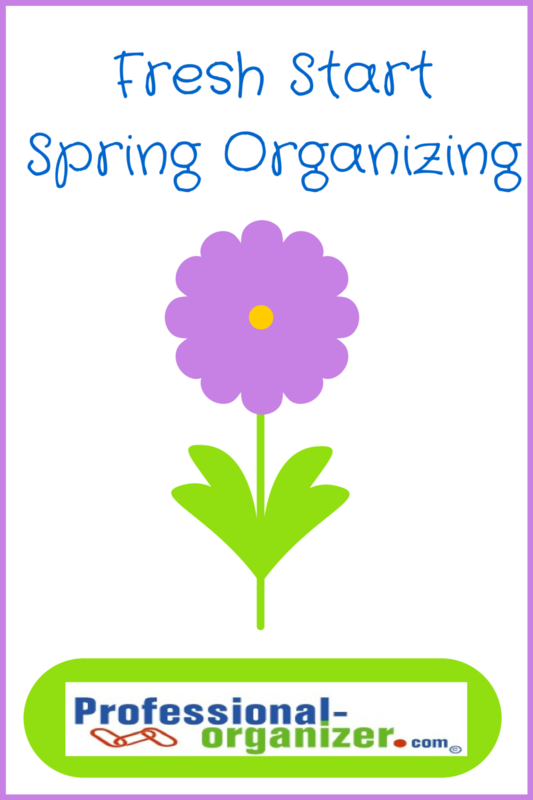 A fresh start for your spring organizing is a great way to be ready for the season. 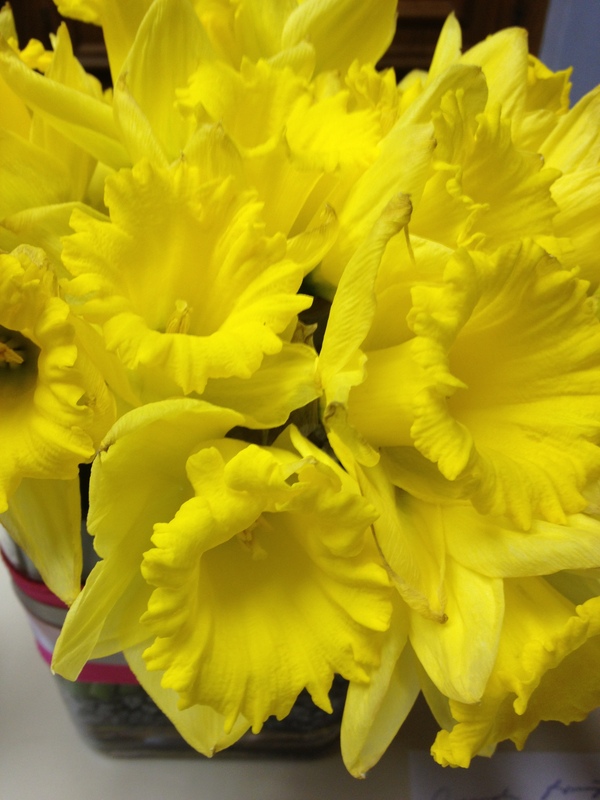 Join my newsletter for loads of fresh spring ideas. I am grateful for our connection! This year has connected me to more colleagues, friends, family and clients. Each of you has shared my joy with laughter and silly sayings. You have each shared with me leadership, learning, transitions, reflections, and hugs! May your gratitude be a part of your daily habits. Find a small, simple way to make this happen each day. Thank you for all you have shared with me this year. As we enter the holiday season, I look forward to hearing what you are each grateful for. Post a comment below to share your gratitude. May your holidays be filled with hugs and happy organizing! 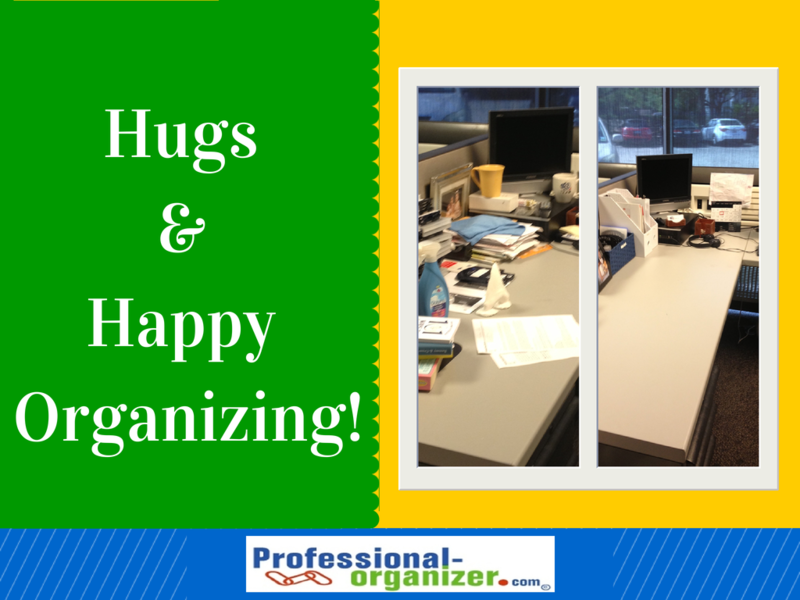 Hugs and happy organizing are client success stories. Here’s a story about a client’s office. Office desks become overwhelming with scraps, notes, and more. It’s hard to find the time to organize at work. Why organize when every day is chaotic? There are simple steps to organize your office space. Refresh your desk every evening and do a major overhaul monthly to keep productive in this space. Decide what’s most important and what you use daily. These tools are the only items that remain on the desk top. Set up a command center for actionable tasks and current projects. Decide on what works best for you for a task list and consolidate all your post it notes there. Establish a reference area in a desk drawer or corner of your desk. Keep what you refer to often in a notebook with inserts on the desk or a hanging file in your drawer. Take home extra items that belong at home, such as extra pairs of shoes, books or personal items. Keep a drawer with personal items such as lotion, snacks or hand sanitizer. Check out these small biz ideas! Hugs and happy organizing are client success stories. Here is a story about a client’s command center in her kitchen. Paper is a necessary evil on our kitchens. It’s best to have a dedicated command center in our kitchen for paper, school supplies, technology and projects. A kitchen desk and cabinets make up a great station for these items. Clear out your cabinet completely. Keep this area designated for just the command center. Consolidate office supplies, use bins to keep them together and label the bins. Keep a daily routine to go through the mail and backpacks for 5 minutes daily. Once a week set up an hour to work on papers and other admin tasks at your home. All good organizing systems rely on having a place for everything. If you have more categories, you need more bins. Having a good routine for daily and weekly management makes a difference too. Join my newsletter for monthly productivity and organizing tips.